First, I'm green jelly here. SO want to read this one. WANT. :) Now you give me this review and I'm wondering why it's not in my hot little hands right now. This sounds like what I wanted in the series and I was afraid I wasn't going to get it. Oh now I really can't wait! Aw, gorgeous review, Keertana! You are so eloquent--I agree with everything you said. I loved being in Willem's mind--I love that he isn't written as this perfect guy, pining away for Allyson--even though he is a mysterious figure in Just One day, I knew enough about him to know that pining is not Willem's style. So I applaud Forman for allowing his character's integrity to remain intact. "And while there is the admission that both Willem and Allyson will be fine alone, there is also the truth that they will be remarkable together. " That's a wonderful, wonderful statement--and so true. It's no secret that I haven't had the best of luck with Forman's novels, and so Just One Day failed to completely wow me. I really enjoyed the ending of that one though, and so that leaves me with much hope that I'll enjoy this one significantly more. I can definitely see myself getting frustrated in this novel- with all those near-misses, and the fact that it takes Willem such a long time to realize that one day did indeed change him, but I'm hoping that it will be the good kind of frustration. Also, I'm really looking forward to finding out about Yael and Bram's love story, and how that parallels Allyson and Willem's story. Also, I'm already cheering for this deep parent-child relationship, especially because Willem is older. I'm already looking forward to reading about that, and seeing how things play out between them. The parallel between the two of them and Willem's parents sound fascinating, and this generally sounds ridiculously well plotted/imagined. Foreman IS brilliant in that regard, I know that just from reading her first duology. She has a great talent for subtleties and small truths of life that strike you as shocking in their honesty. I think she's a lot like Melina Marchetta in that way. I have yet to read this, I didn't want to until both books became available, but now that they are, I have no more excuses, do I? Lovely review, my darling. You fascinate me. Keertana this is once again such a gorgeous review, you have totally hit the nail with how I was left after reading this book and that is stained. I loved how much we got to learn about Willem's character, I was extremely unsure about his character in Just One Day, but I'm glad we were finally able to get into his head. I also loved the secondary characters that we got to meet, especially Yael! 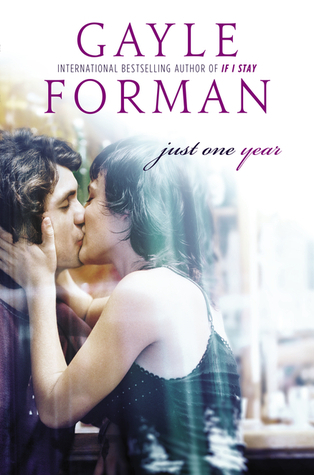 I know for sure too that Forman will be one of my favourite authors for a long time! As for Gale Forman, I haven't actually read any of her books yet. I do have 3 of them on my shelf, I am just working up to diving into them - I know her books can be pretty profound and emotional, I kind of feel like I need to be in the right mood for them :) I'm so glad you enjoyed this one so much - I love both the cover of JOD and JOY, so lovely! Oh Oh Oh.... I am waiting to read the first book. It is right at the tippy top of my for real pile and will get this one from the library soon. I'm also at the tippy top of the list. I am beyond excited to see your rating! I haven't read this series yet but I read If I stay and I loved it so much that it made me cry, so I'm definitely gonna read this too! I gave my ARC to our new coblogger to read so I am exercising great restrain in not reading your review yet, but I did peek at your rating. :D Yay for 5 stars! I can't wait. I love how the differences in Allyson and Willem's journeys in the year after their one day speak to who they are as people, and why they are such a fantastic couple. I loved Bran and Yael's story, but it's not until the very end of the book that you get the full impact of it in a way that really floors you. "despite the fact that Lulu lives in Willem’s thoughts for the majority of this novel, Forman convinces us that what they share is more than just a passing fancy; it’s true love." YES YES YES to this. Forman's ability to emotionally connect to these two and believe in them so strongly, after they've spent ONE DAY together, but we've spent a year with each of them, is just mind bogglingly beautiful. I also love what you said about the fact that these two could be fine alone, but in that moment that they intersect again, they choose together. xo LOVELY LOVELY! Are you glad you waited until the end to read the conclusion? It was completely worth it, wasn't it :). PS. I just finished INTO THE STILL BLUE! Let's discuss it when you finish. If you are looking for a solid contextual advertising company, I suggest that you try PropellerAds. Did you know that you can create short links with AdFly and make cash for every visit to your shortened urls.